Home / Articles / Studying Abroad – It’s not scary, promise! Ni hao! 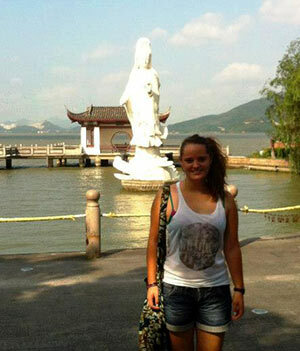 My name’s Peggy and I’m a student (from the UK) studying at The University of Nottingham in China. Every student has a different reason for choosing to study abroad. When I get asked, I always have the same answer; I want to explore the world. It’s such a cliché, I know, but it’s true! Moving from my home to university was a big step, but once I made the break, I didn’t want to stop. My parents were fairly keen on the idea of me going abroad until I announced I was heading to China. They couldn’t understand why I wanted to go so far away to somewhere so different. But China is a vast and diverse country, with the highest population and the most spoken language in the world, yet it’s still fairly undiscovered by the West. Now, at some point somebody is going to turn around, realise just how much there is to explore in China and suddenly it will be a top tourist destination. While I believe China will retain its true identity, some of the magic may get lost. I hope to explore China before that happens. I will be honest, being so far away from friends and family does have its downsides. I don’t know anybody who hasn’t been a little bit homesick at some point. However, it’s easier than you think to make friends in Ningbo, so you’re unlikely to feel lonely. Also, I’m finding that with Skype and WeChat, my family, friends and boyfriend don’t seem all that far away, so don’t let homesickness put you off doing what could be one of your greatest adventures. When going abroad, it will be what you learn outside of the classroom that will really stay with you. Of course your classes are important; they don’t call it STUDY abroad for nothing, but the experiences you have and friends you make will be what’s really important. Outside of university life, there’s rather a lot to explore. In the Spring Festival holiday I was fortunate enough to travel northwards from Ningbo to see some of China’s highlights. Along my ventures I visited Shanghai (only a couple of hours by train from the University) and Beijing, but the highlight for me was heading to Harbin. Due to our disorganisation we forgot to book a train from Beijing to Harbin, so we were stuck on a 17 hour bus ride, but it was absolutely worth it. 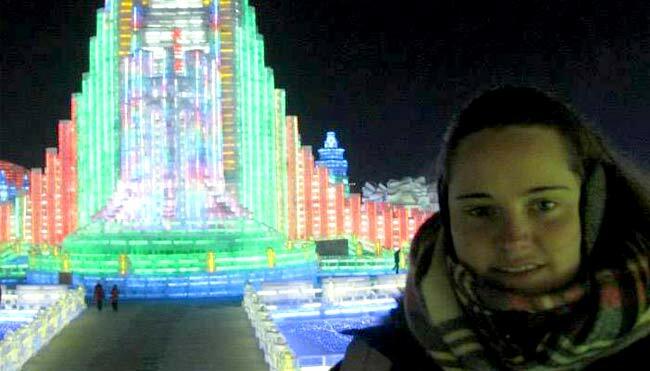 Waiting in Harbin in temperatures colder than -20°C was the Ice and Snow Festival; a stunningly mesmerising collection of structures made entirely from ice. I enjoyed slipping down ice slides whilst my companion embraced the ice bar and we later regrouped at the hot springs. Not one minute of this adventure could I have experienced at home. One of my favourite things about Ningbo is its amalgamation of Chinese and Western cultures. Everything from UNNC’s English garden to the cities Irish pubs offer homely comforts, whilst also finding yourself submerged in Chinese tradition and historical museums. You’ll find familiarity with Pizza Hut, KFC, McDonalds, Costa Coffee and Starbucks on nearly every corner, whilst you’re treated to hundreds of unexplored dishes in local restaurants stacked on every street. Maybe you think getting clothes will be a problem, not really. Intricate markets offer low cost Chinese products, while the numerous malls house all your favourites; H&M, Zara, UniQlo, GAP, CK, Levis and many more. UNNC offers a wanderluster (someone obsessed with travelling) everything they could want, whether it be for a single semester, an entire year or your whole degree. Like all adventures, it will have its ups and downs, but I guarantee you won’t regret a second of it.